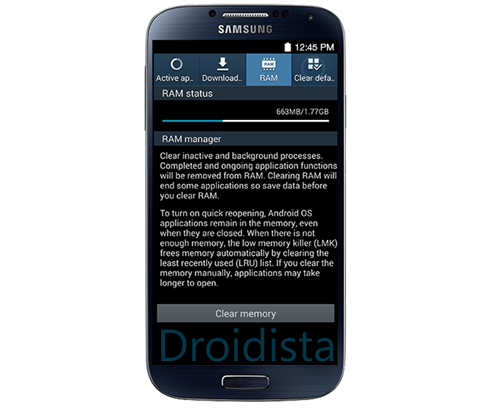 This post will guide you through accessing the Recent Apps screen, closing apps running in the background, accessing the Task Manager, and clearing your Galaxy S4's RAM. From any screen, tap and hold the Home key. You will now find the list of apps you recently used. Tap and hold an app and you'll have two options: App info and Remove from list. Tapping App info will allow you to clear data and clear the cache, or even uninstall the app. Choosing Remove from list will close the app. Another way to remove apps from list is to swipe each one left or right. You can also tap the Close all icon in the bottom right to close them all in one tap. You cannot close all apps that run in the background from the Recent Apps screen that is why it is necessary you access the Task Manager because it's there that you can have access to active applications. From the Recent Apps screen, tap the Task Manager icon (the one that looks like pie). There are four tabs and Active apps is chosen by default. You can close each app by tapping the End button to the right or the End all button to close them all. The Downloaded tab lists down all third-party apps that are running; Uninstall is the only option. The RAM tab will give you access to the phone's memory; hit the Clear memory button to improve performance. The Clear defaults tab will allow you to reset each app on the list. Lastly, the Storage tab will give you an overview of the internal and external storage. These two procedures alone can help you speed up your device or optimize its performance. I hope that this guide have somehow helped you.